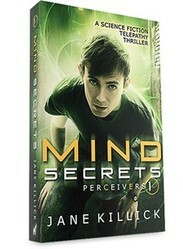 Aimed at young adults, the first book in Jane Killick's Perceivers series investigates a world in which teenagers have developed the power to perceive other people's thoughts and emotions, a situation that leads to strong distrust by the adult population who look for ways to "cure" them of this ability. Imagine being able to read other people’s minds, imagine the advantages that would give you, both in your business and personal lives. But then again imagine what it would be like if someone could read your mind, see into your most intimate and private thoughts. How would you feel? Upset? Violated? Angry? Yes, angry. And now imagine a world in which a large number of people could all read your mind, but you couldn’t read theirs, and multiply that anger accordingly. Set in London, Perceivers is a young-adult novel that tells the story of such a world, where one in five teenagers has the ability to read not people’s minds as such, but their emotions, to know whether or not they are lying, how they are feeling. But that was enough to start a backlash from the adults, a backlash against all teenagers not just the so-called perceivers, and the results were brutal. But for Michael, who has woken with amnesia and had to stab a man to escape from his captors, the perceivers could be the key to unlocking his memories. To add to the mix, the government has found a way to “cure” perceivers, but when this happens to a perceiver Michael knows he discovers that as well as removing the ability to read minds, the cure also changes their personality – his friend moves from being a rebellious cocky teenager to a shadow of his former self. The novel goes at breakneck speed as the events themselves escalate from minor skirmishes to a major demonstration. Jane Killick integrates these events well, as the political and the social aspects of the story intertwine. Michael finds himself caught between his emotions to parents he cannot remember and to new friends whom he hardly knows. And all the while he is being chased and captured by people who could be friends or enemies. He doesn’t know what they want with him or why they consider him so important. Yet given the somewhat complex nature of what is happening, this is very much an action book. There are chases, there are arguments, there are fights, yet all the while progressing the story in a very readable fashion. Though aimed at teenagers, the book can be enjoyed by adults and young adults alike, without either group knowing what the other is thinking. Jane Killick is best known for her season-by-season guides to Babylon 5 and as a journalist on various science-fiction magazines. She also wrote The Making of Judge Dredd and Stasis Leaked, a guide to the first season of Red Dwarf. She is a broadcaster and can be heard reading the news on BBC Three Counties Radio. Perceivers was her first novel. Perceivers (ISBN 978-1-4467-5564-8, 325 pages), first published in 2011 by Elly Books.